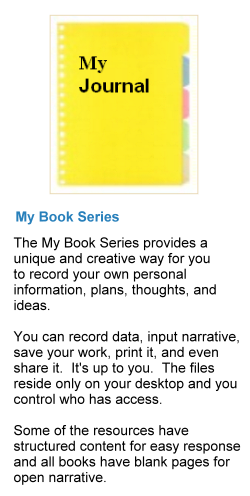 The My Journal includes an input page for each day of the month and is indexed by day for easy accessibility. This is a great place to record your thoughts and observations. You can save, print, post a sticky note, search, and copy and paste portions you wish to share with others. The format includes structured and open format content, an appointment calendar, and a to-do list. You can also drag the file to your desktop for easy on-demand access.